Staff was excellent! Room was clean, but a bit small. Convenient to the train station but pretty far from main attractions. 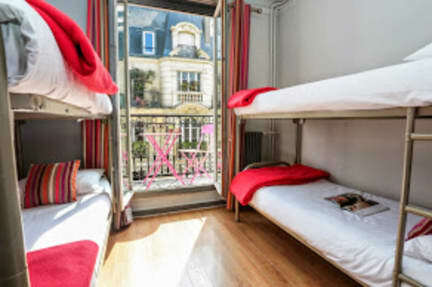 hostel is very convenient for Gare du nord and great views from the Sacre Coeur. Dorm was secure but no plugs near beds and being on the top floor the room was way too hot. Sadly other guests were messy but the cleaning in the morning was so good you couldn’t tell. Staff were polite but not overly friendly. Good value for money if you just want a bed somewhere, if you want a hostel for atmosphere and making new friends, probably not. Hostel is at fine location and rates are reasonable too. But very congested and feels like squeezing in. Paris is just way over prised so you don’t get much for a lot of money. 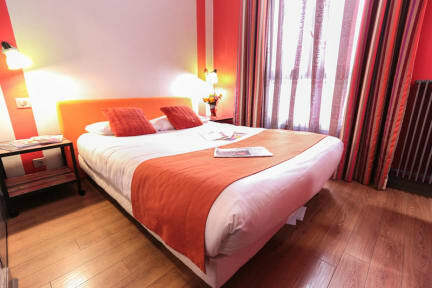 Great location being close to Gare du Nord and walking distance from areas such as Pigalle and Montmartre. The hostel itself is nice, it has everything you need. Showers could be a bit nicer but other than that, the place was good for my one night stay. Facilities not as good as expected.